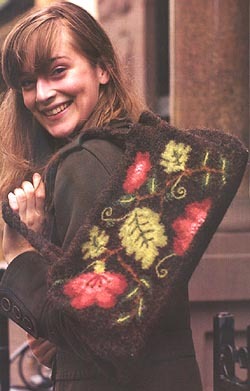 This felted purse is knit using Jamieson's Shetland Double Knitting 100% wool yarn and is from the Holiday 2006 Issue of Interweave Knits magazine. The design is by Nicky Epstein and yarn kits are detailed below. The magazine article specifies Jamieson's DK yarn in the old 57g skein format. The kits shown above have been recalculated with the new 25g ball format. The pattern is not included in the kit but is from the Holiday 2006 Issue of Interweave Knits magazine.